Jennifer Lawrence and on-off boyfriend Nicholas Hoult teamed up to attend San Diego’s famous Comic-Con film event over the weekend – just days after it was revealed they’re ‘in love again’. The pair joined A-list cast mates – including Michael Fassbender and James McAvoy to promote their latest sci-fi flick, X-Men – First Class 2. The picture of effortless elegance, Jen wowed in a white Alexander McQueen dress, Nicholas Kirkwood pastel heels, and EF Collection rings and earrings, while her British actor beau dressed down in jeans and a sweater. Although the couple are thought to have ended their two-year romance in January, rumour has it they are ‘fully back on,’ after meeting up on the X Men set. 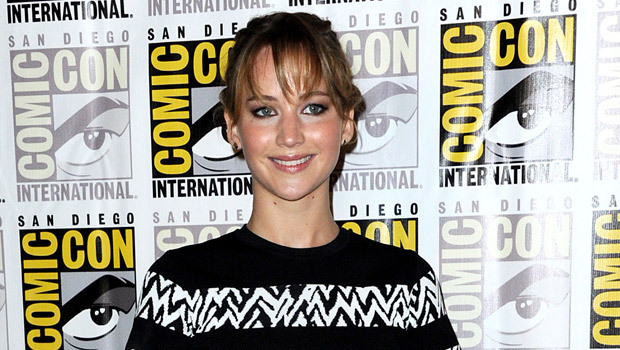 Jennifer Lawrence’s X-Men appearance was one of several she made at Comic-Con over the weekend. Dressed in a statement Proenza Schouler top and skirt, the actress also joined co-stars Liam Hemsworth and Josh Hutcherson to preview the trailer for hotly-anticipated new Hunger Games movie, The Hunger Games: Catching Fire.